Matthew Preston listens to his sentence of eight years in a state facility with a lifetime driver’s license suspension, Monday. 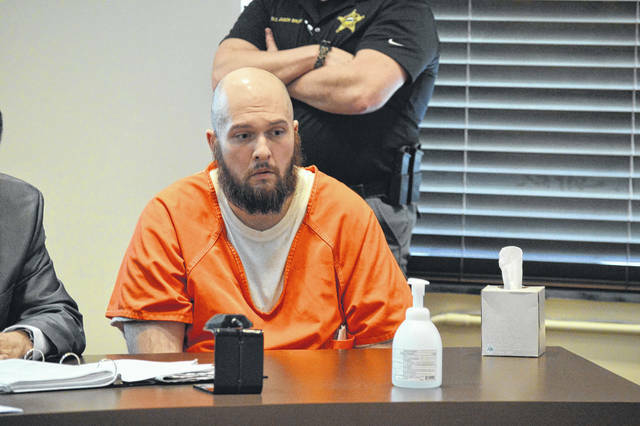 Preston was charged with vehicular homicide in connection with the August 2018 death of Gallipolis resident, Robert Baxter. Preston had tested positive for nine different drugs in his system said Ohio State Highway Patrol officials, three of which were cited as being in high enough measurements to cause his impairment. GALLIPOLIS — In what has been described as part of a growing trend in narcotic-related OVI crimes, a Crown City man was sentenced, Monday, to eight years in a state facility with a lifetime license suspension for the second-degree felony of vehicular homicide which ultimately resulted in the death of Gallipolis resident, Robert Baxter, 66. Several statements followed from family members, one saying that a “five-gallon bucket could not hold all the tears” that had been shed since Robert’s death. Gallipolis Municipal complaint records say that Preston “was traveling westbound on State Route 588 in the area of milepost 6 (Aug. 15, 2018, afternoon of Gallia County). At this location, Preston struck Robert Baxter (Jr.) as Baxter was traveling on a motorcycle eastbound on State Route 588. At the time of the collision, Preston was traveling in the eastbound lane of State Route 588 while attempting to pass a truck on a double yellow line…Due to the impact of the collision, Robert Baxter suffered fatal injuries. (Troopers) were on scene and while conversing with Preston observed signs of obvious impairment. At the request of (the trooper), Preston performed standard field sobriety testing and was determined to be impaired. (Troopers) arrested Preston for OVI.” The collision happened at roughly 12:37 p.m. According to case information, Preston reportedly had nine different chemical substances in his body at the time of the collision. Ohio State Highway Patrol officials say that three of those substances were in high enough measurements in Preston’s system to cause his impairment while driving. The highest three were heroin, amphetamine and methamphetamine. The others included codeine, morphine, fentanyl, norfentanyl, clonazepam and amino-clonazepam. Law enforcement says drugs are commonly cut with others, so the smaller amounts might have been part of a consumed mixture. Preston had two previous encounters with law enforcement within a 48-hour period, starting Tuesday, August 14, 2018. One encounter was reported to occur at a Rio Grande business at roughly 3:14 p.m. where he was discovered unresponsive with keys in the ignition of a running vehicle. He was reportedly revived with five doses of Narcan. The second was reported at a business on Jackson Pike with Preston at approximately 11:39 p.m., the same Tuesday evening. He was arrested for OVI, after going through a field sobriety test, taken back to the Ohio State Highway Patrol post and processed for the reported incident. Preston was released into the care of an individual who had the situation explained to him, that Preston was still impaired, and who signed a release form to take Preston into their custody and care. Preston was released around 1:30 a.m. in the morning, August 15, 2018. The fatality which resulted in Baxter’s death happened around 12:37 p.m., that afternoon. Statements were given by Preston’s parents, daughter and himself. They apologized to Robert’s family for what had happened and said they wished it was something that had never occurred. They said Preston had struggled most of his adult life with pain and addiction due to a back injury that had occurred in his early 20s that disallowed him from continuing his last year of college, although it did not excuse what had happened to Robert. Gallia Common Pleas Judge Margaret Evans said that initial reports taken by OSHP troopers interacting with Preston at the scene of the crash indicated that he wished he was able to trade places with Robert at the time. She eventually sentenced Preston to the full eight years allowed by law for his crime as asked by the Baxter family. Preston had over a decade of encounters with law enforcement and court officials for various drug issues. OVI charges in Ohio are typically considered misdemeanors. An OVI charge becomes a felony when a suspect has three or more previous OVI convictions within a period of 10 years, according to 4511.19 of the Ohio Revised Code. According to Gallipolis Municipal Court online records, Preston had no previous OVI charges. Preston also was previously charged with two first-degree misdemeanor OVI counts and one second-degree misdemeanor possession of a drug abuse instrument as well as a minor misdemeanor for marijuana paraphernalia. He pleaded guilty to one OVI charge and one for possession of a drug abuse instrument in the Gallipolis Municipal Court. The other charges were dismissed. He was sentenced to a mandatory fine of $375, a mandatory one-year license suspension, a maximum of 180 days in jail and credited with 156 already served because Preston never posted bond. His sentence will run concurrent with what was declared in Gallia Common Pleas as per the Ohio Revised Code. For the drug abuse instrument charge, he was sentenced to 90 days in jail, which he was credited with 90, having already served them. In an attempt to follow procedure, Davies said Rio Grande police went to converse with the solicitor for legal counsel to make certain what was the best course of action to take next. A warrant was not issued until after the conversation with the solicitor. According to an earlier conversation the same August with Ohio State Highway Patrol Commander Lt. Barry Call, troopers had another incident at a gas station on Jackson Pike with Preston at approximately 11:30 p.m., the same Tuesday evening. He was arrested for OVI, after going through a field sobriety test, taken back to the post and processed for the reported incident. Preston was released into the care of an individual who had the situation explained to him, that Preston was still impaired, and who signed a release form to take Preston into his custody and care. Preston was released around 1:30 a.m. in the morning, Wednesday. The fatality which resulted in Baxter’s death happened around 12:37 p.m., that afternoon. “One of (law enforcement) processes is allowing an impaired driver to get a ride (when released),” said Call previously. Of impaired drivers picked up by OSHP in 2018, about 47 percent of them were found to be under the influence of narcotics and law enforcement expects that number will grow. Call said the post had roughly 350 OVI arrests throughout Gallia and Meigs County. The commander said troopers had followed protocol while handling Preston’s case and that currently no changes in policy were in motion with an impaired driver being released into the care of a sober individual. Preston could have received a two-year minimum sentence.